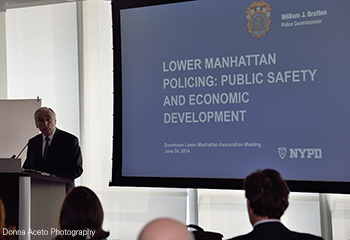 WilmerHale hosted New York City Police Commissioner William Bratton as the featured speaker during the monthly Downtown-Lower Manhattan Association (DLMA) meeting held in the firm's New York office on Tuesday, June 24. 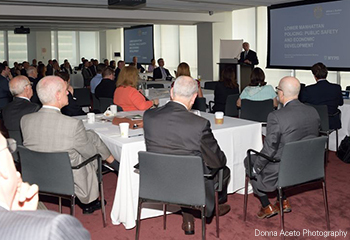 Charles Platt, partner-in-charge of WilmerHale's New York office, provided welcome remarks to approximately 100 attendees, which included prominent business and policy leaders of Lower Manhattan. 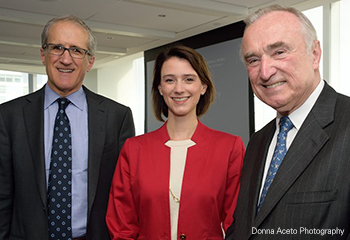 Jessica Lappin, president of DLMA, introduced Commissioner Bratton who then delivered a presentation on the longstanding and evolving concerns of public safety for Lower Manhattan. In Commissioner Bratton's presentation entitled "Policing, Public Safety and Economic Development," he provided a compelling time lapse analysis of the decreasing crime rates and increasing real estate values for New York City neighborhoods over the last two decades as a result of the development and growth of the city. 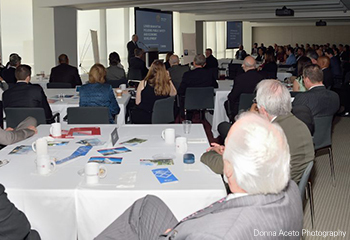 Commissioner Bratton was optimistic as he spoke of the future economic development of Lower Manhattan-which is largely known for its collection of finance corporations-as the district continues to develop residential and mixed use communities. WilmerHale moved its New York office from Midtown to Lower Manhattan in July 2012 and has since been involved with the Lower Manhattan business district community. "WilmerHale has a long history of supporting organizations in the communities in which we practice," said Platt. "We encourage leadership on the part of our attorneys through service boards and committees, as well as volunteering within those communities. We are pleased to be a part of the renewed efforts to revitalize the Lower Manhattan area." Partner Molly Boast was recently appointed to the DLMA Board of Directors where she serves alongside area business leaders to further the revitalization and growth efforts of Lower Manhattan. WilmerHale also sponsors the Downtown Alliance, sister organization of the DLMA, to provide free Wi-Fi at several public places throughout the district. Photos courtesy of Donna Aceto Photography.